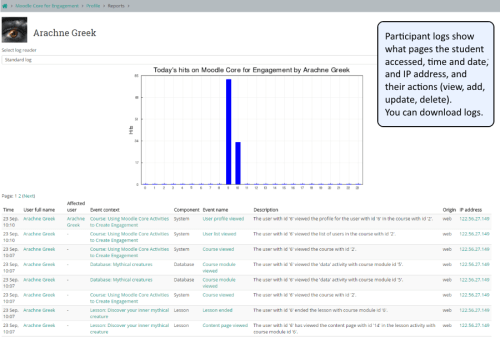 Today I want to share a few ideas around monitoring in Moodle: Setting up your Moodle courses to reduce the teacher management workload, effectively monitor student progress, and empower students with the autonomy to self manage as they progress through their studies. So often teachers talk of the high workload in managing online components of the their courses; checking which students have completed what tasks, looking for forum contributions and checking what needs marking. This post will show tracking options and reports available to teachers and students. I will focus on core tools that are available in a modern Moodle standard install. There are excellent modules and plugins available, however they’re not much use if you don’t have admin rights, so here’s what tools you will have. 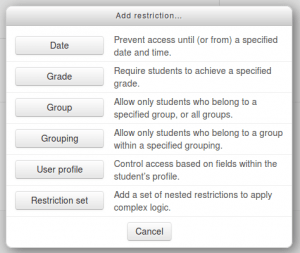 If the Moodle site has activity completion enabled this can drastically improve course management and a huge time saver for both the teacher and the student. Setting up activity completion is discussed later in this blog post, so keep reading! The reports above are largely teacher focused. Next, let’s look at the reports and tools primarily for students. I have used this approach in a course that has an elearning pre-requisite to a face-to-face workshop. The learner prints their complete report and brings it to the workshop, instead of printing a large workbook. When I teach people how to use the reports and logs I give them scenarios to consider in groups. 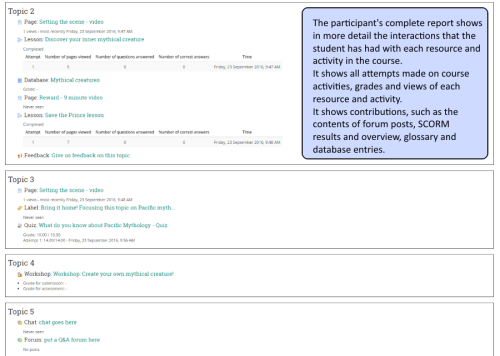 When I teach this I show how to setup activity completion settings on existing activities such as forum, glossary, page, quiz, and assignment. I discuss with teachers self marked quizzes that show as complete immediately on submission, versus teacher marked assignments which can show as complete on submission or complete when a grade has been received. When the “completion” happens on grade received there is a delay. 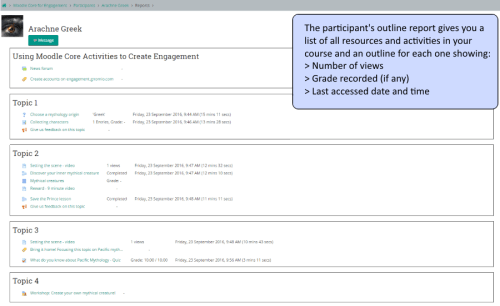 You can use restrictions to stop learners from viewing the certificate module until after feedback activity is marked complete, and they have a grade of 100% on the assessment activity. This ensures instructional designers are always getting feedback on their development, and the learner has met the assessment standards agreed with the SME. When I teach course completion criteria, I demonstrate how to set this up and then encourage them to give it a go. 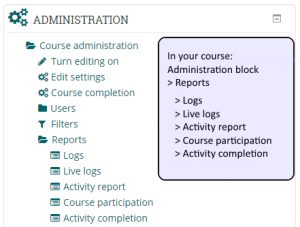 Documentation for setting up course completion is here – Moodle Docs > Course completion – and you should totally read it. Look at what is automatically put into the grader report, and what you can manually add, show how to set up categories and grade items, how to use groups for filtering and set grade visibility, type (real/percentage/letter), and weighting. Get the workshop participants into groups and give them an existing course that is not currently used by students. Ask the groups to organise the grader report in a way that makes sense to their group, add categories and grade items as necessary, and decide on the weighting of activities. What I want teachers to think about are the benefits to the students for having the grade structure organised, as well as themselves and moderators and auditors of courses. I ask workshop participants to share examples and discuss ways they can use these features in their courses. Feedback on these workshops is overwhelmingly positive. Participants are keen to spend more time on familiarising themselves with these features. I hope this blog post helps you monitor your students or provided you ideas for your courses. If you haven’t already heard, it’s Moodlemoot time again in NZ. You’ll be in the right place if you find yourself in Hamilton at the University of Waikato this Monday to Wednesday 22 – 24 April 2013. Moodlemoots in New Zealand usual boast three streams: technical, general and teaching. Keynotes this year include Martin Dougiamas (founder of Moodle) and Don Christie (ex-President of the NZ Open Source Society, councillor of InternetNZ, co-Chair of NZRise). The usual fun and frivolity can be expected at the conference dinner, this year at Viligrads. With only a few days until Moodlemoot 2011 I thought I would write a bit about what to expect (in addition to a good time). There will be a great range of presentations throughout the conference, including technical sessions like Dan Marsden’s talk on “Crot and Turnitin: plagiarism detection tools” and school sessions like “Moodle and Teaching as Inquiry” with Mark Osborne. Perhaps the best bit on the programme – “Open Space” – time for ‘user generated’ discussion – it’s led by you! and the conversation can go anywhere. As usual, we will have workshops running the day before the two day conference. The conference dinner, a not to be missed experience, will be held at “The Floating Pavilion” at the Viaduct. If you haven’t already registered this is really the last chance, so go to the online registration form here now. I look forward to seeing you there! iMoot is an online international conference (run on Perth time) organised by Pukunui (a Moodle Partner in Australia with a Kiwi name) with three streams (how to’s, academic papers, and case studies). Registration is AUD50 early bird. The call for presentations has been made so start thinking about what you might be interested in presenting on.